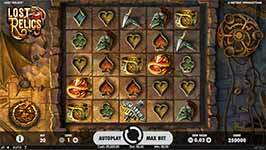 Review of: Lost Relics Online Slot for Free Play by NetEnt at Slotorama! Search out ancient treasures with a famous archaeologist in Lost Relics slot by NetEnt. This 5-reel slot has 5-rows and pays via the Cluster Pays mechanism when you get 6 symbols connected together. You can dig up all sorts of bonuses as you can see listed below. Random features can strike after any winning spin in the main game to award coin wins, extra wilds or extra scatters. Trigger the free spins bonus round where you might be lucky enough to discover the Hidden Chest bonus game! Cluster Pays – 6 or more symbols appearing in a cluster award a win according to the paytable. A symbol is part of a cluster if it is horizontally or vertically adjacent to the same symbol. Random Features – In the main game, when a spin results in a winning combination, up to five instances of three random features in any combination may be activated after the reels stop, but before any wins are paid out. The main game contains the following random features: Coin Win feature, Extra Wild feature, Extra Scatter feature. Coin Win – When the Coin Win feature is activated, one of the symbols in a winning combination awards a coin win of between 3 and 30 times the bet. Any wins from the Coin Win feature are added to any wins from the round that activated the Coin Win feature. The symbol awarding the coin win is still a part of the winning cluster. Extra Wilds – When the Extra Wild feature is activated, three extra Wild symbol are awarded and randomly placed on the reels in the positions that are not part of the winning cluster and not occupied by Scatter or Wild symbols. Up to 15 Wild symbols may appear on the reels as a result of the Extra Wild feature. Wild symbols may contribute to a cluster of any symbol and may be a part of more than 1 cluster. Extra Scatter – When the Extra Scatter feature is activated, one of the symbols in a winning combination awards an extra scatter symbol. The symbol awarding the Extra Scatter is still a part of the winning cluster. Free Spins – Land three scatter symbols in the main game to activate 10 free spins. Scatter symbols can appear anywhere on reels 1, 3 and 5 in the main game (except scatter symbols awarded by the Extra Scatter feature which appear in the winning clusters in the main game). Hidden Chest Bonus – In Free Spins, a chest occupying a number of spaces is randomly hidden behind the reels. Spaces under the winning clusters become uncovered and may reveal the hidden chest. Uncovered spaces carry over to the next spin until the chest is fully uncovered. After a chest has been found, the uncovered spaces are reset and must be uncovered again, and a new chest is hidden in a random location.